I'm not a fan of remakes. I'm just not. There are so many ideas out in the world that I just can't believe what gets turned around into a remake at times. Case in point: The most awesome [rec] being remade in the SAME YEAR, only to fail at the box office. But, with that said, there are some remakes that really bring something new and fresh to the table. Perhaps it's just a retelling of a story that has been around for a long while. THE BLOB is one of those exceptions to the rule. The Blob remake updates and retells a story that's loved by many while adding a little spice to the execution. 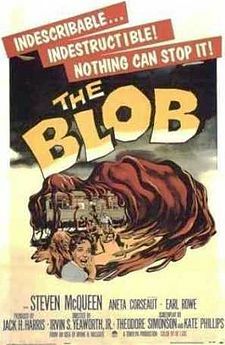 The original 1958 Blob is pretty awesome on its own. If you have yet to see it, you can view it through the wonders of YouTube. The title music alone is well worth a viewing! :) And...I mean...Steve McQueen? Oh yeah! The action is fun and the 50s styling is a sight to behold. 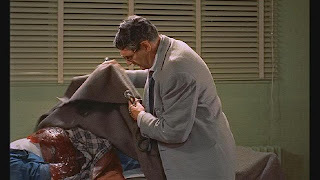 It has that youth against the man thing, too, which is always a nice little nugget in these films. The story is simple. A meteor falls out of the sky and the poor man that finds it finds out that the goo contained within is alive and hungry. The goo wraps itself around the old man's hand and he can't get it off. McQueen and his date Aneta Corsaut (purrrr) find the old man and bring him to the doctor. And so begins the tale of THE BLOB. As it eats, it gets bigger. You see where this is going. Along the way, you get a bit of small town feeling, youth vs. adults and general terror as the Blob grows and grows as it eats it's way through the town. Nothing seems to be able to stop it. It can crawl through small openings and under doors and it becomes more mobile as it grows larger. A great story with some fantastic moments of tension and suspense. The original relies on some masterful edits and storytelling to avoid showing much in the way of gore or body horrors as the Blob ingests it's victims. So, for the 1988 remake, they add that into the mix to liven things up a bit, retelling the original story with the addition of some grotesque and nasty body horror moments. The Blob is like the perfect eating machine, breaking people down within moments and adding them to it's own body mass. The effects are nasty and the tension and action is ramped up considerably. What we're really seeing here is the same story ramped up from 1950s acceptable horror to the over the top effects heavy world of the 1980s. And, every bit of the fun is on screen and in your face. Kevin Dillon is no McQueen, but turns in a decent performance. Fans of the SAW franchise machine will recognize Shawnee Smith as Dillon's main squeeze on this thrill ride. 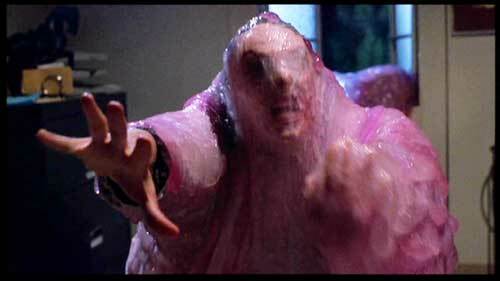 Chuck Russell's stylistic direction works well for this film and there are some really smart and interesting scenes of the blob attacking that I'm not sure I'll ever forget. (Sink and phone booth come to mind...yikes...) I remember my palms being sweaty when I saw this in the theater back in '88 and it holds up rather well today. Especially the horrific results of the Blob attacks. But, now we come to the point of this little article - did The Blob need to be remade? Did it need the ramped up action and gore-heavy effects work? Did it need to be updated and retold in a modern day setting? I guess that really depends on the viewer. 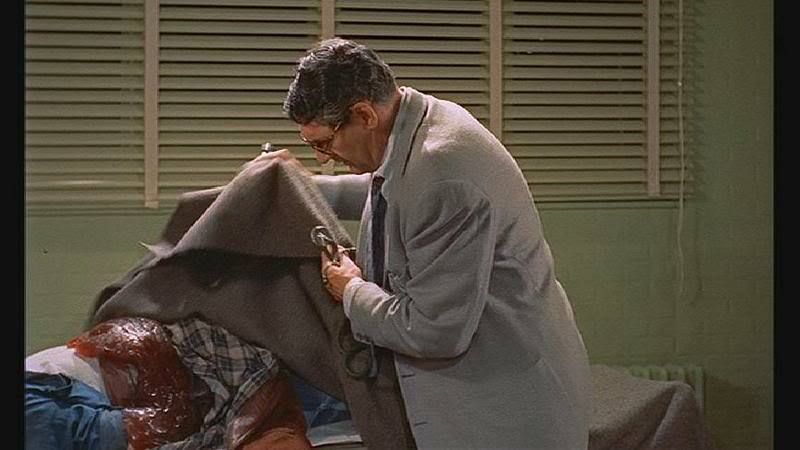 There's a lot to be said for classic horror cinema. 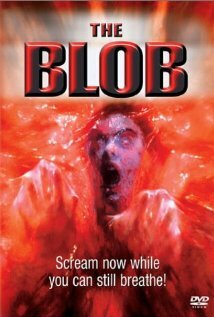 Of watching a film like The Blob and seeing the charm and style of it's original world that it was created in. The time frame and reference point of creation. However, seeing something retold in a new world can be very interesting as well when done properly. A cleaver screenplay and a new breath of life into a film can be very refreshing and fun to take in. In short, I'm starting to see that remakes are not necessarily the issue. It's often that fact that there is little time or effort made on some of these remakes that is the real issue and the real source of my hatred of the "remake" in general. Sloppy and silly screenplay writing will always give a film nothing to stand on - remake or not. So, keep trying, Hollyweird. Go safe with the remake path and have at it tossing more cash, effects and time into them. At the very least, older movies can be viewed by children and people with a lower tolerance for violence and gore.